00:55:00 Makes 18 servings, 1 piece (132 g) each. Makes 18 servings, 1 piece (132 g) each. 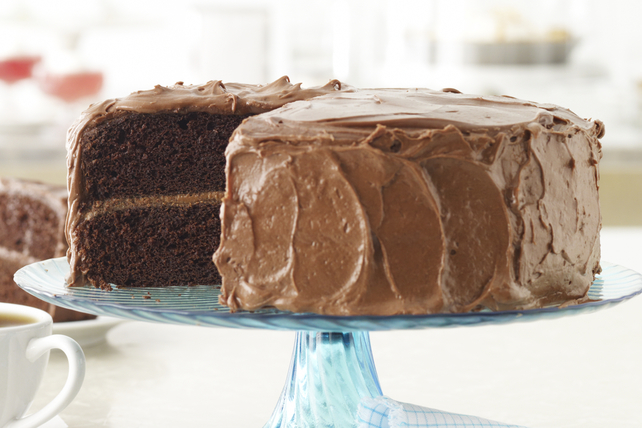 The MIRACLE WHIP in the batter make this fudge cake not just super rich, moist and amazingly delicious, but the best ever - it’s the (not-so) secret ingredient in our top-rated MIRACLE WHIP Fudge Cake. Melt 6 oz. chocolate as directed on package; cool. Meanwhile, beat Miracle Whip, brown sugar and 1-1/2 tsp. vanilla in large bowl with mixer until well blended. Add eggs and melted chocolate; mix well. Combine flour, baking soda and salt. Add to chocolate mixture alternately with boiling water, mixing well after each addition. Pour into 2 parchment paper-lined 9-inch round pans. Bake 30 to 35 min. or until toothpick inserted in centres comes out clean. Cool cakes in pans 10 min. ; remove from pans to wire racks. Cool completely. Meanwhile, microwave remaining chocolate and butter in large microwaveable bowl on MEDIUM 1 to 2 min. or until butter is melted. Stir until chocolate is completely melted. Cool. Add icing sugar, milk and remaining vanilla; beat with mixer until well blended. Refrigerate 30 min. or until icing is of desired spreading consistency. Stack cake layers on plate, filling and frosting with chocolate icing. Warm 1 oz. chocolate by microwaving it on HIGH for a few seconds or just until you can smudge the chocolate with your thumb. Hold the chocolate piece steadily, then draw a vegetable peeler slowly over the flat bottom of the chocolate piece, allowing a thin layer of chocolate to curl as it is peeled off the bottom to make long, delicate curls. Repeat with remaining chocolate piece. Each serving of this sweet treat goes a long way on chocolate flavour. Serving Size Makes 18 servings, 1 piece (132 g) each.